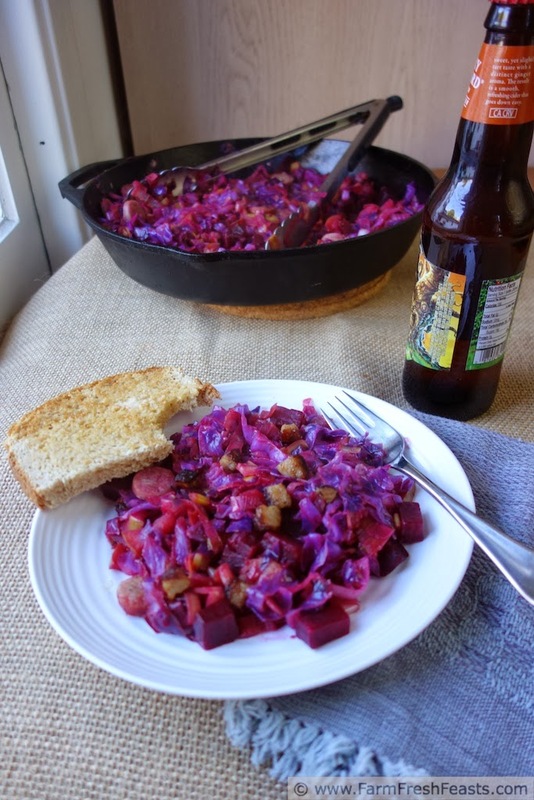 A hearty satisfying skillet supper of cabbage, leeks, apples, and beets seasoned with bratwurst, maple syrup, apple cider and spices. I could say 'low carb' and 'real' if you like those words. Simon and Vincent (Oliver and Crystal the pig are missing) showing off the initial SWSR. Even though I enjoyed a week of sunshine in Florida, last week during HashtagOrangeWeek, winter has its grip on my home and I still want crave hearty fare. This recipe is a hearty skillet supper combining many of the items in a typical Fall CSA share that can be found throughout the winter. I was inspired by this CSA Cookoff segment done by Jennifer of Homegrown.org. I thought it would be a great way to stuff beets a bunch of veggies and a sprinkle of meat into my kids. Score! Today I'll share a skillet full of flavor we affectionally dubbed Hot Pink Mess. Boy, if I were a young hip blogger, this would be the name of some over-the-top decadent dessert or fried appetizer that I'd make and eat after stumbling home in the wee hours. In reality, a humble fried egg sandwich appeals to me in the wee hours, more so than chocolate. Though Meghan's granola comes a close second for nighttime snacks. For more recipes using beets, please see my Beet Recipes Collection. For recipes using cabbage, please see my Cabbage Recipes Collection. For more recipes using leeks, please see my Recipes Using Leeks Collection. 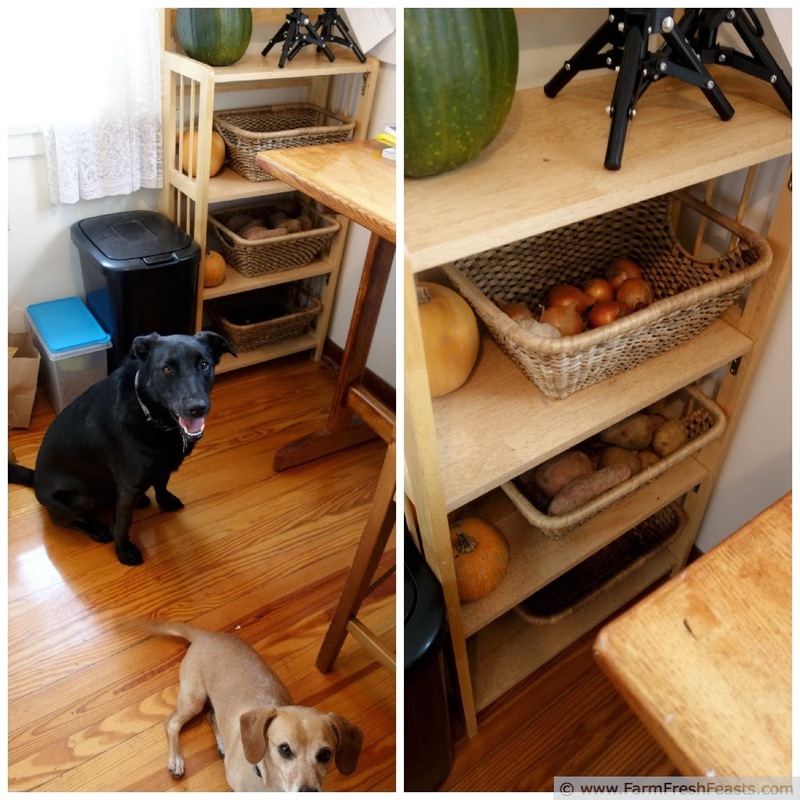 These collections are part of the Visual Recipe Index by Ingredient, a resource for folks like me eating from their farm share box, or from what's at the farmer's market, or on sale at the grocery store, or what grew best in the garden. I'm pinning more recipes on my Pinterest boards, follow me there. I'm sharing a carefully curated look at the world's most handsome Basset hound, Robert Barker behind the scenes on my Instagram feed, follow me there. Interesting articles get shared on my Facebook page, follow me there. Want to know How to Use This Blog? Not shown: caraway seeds, garlic, maple syrup. Really I should just stop with the ingredient photos when I'm making this up as I go, because I always end up leaving something out that sounds like it would go well so I end up throwing it in anyway. At least I take notes on what officially went into the recipe, and those are listed below. Slice 2 of the brats into coins then set aside, and slice the third bratwurst into 4 long strips which you then cut into cubes. Preheat a large skillet (you need a massive one, mine is 12 inches which is terrific for this but makes a rotten weapon because it's too darn heavy for me to swing at someone's head. I recommend a 6 or 10 inch skillet for weaponry) over medium heat and add a turn of oil or tablespoon of bacon grease. Sauté the leeks and apple for 4-5 minutes until they start to soften, then add the cabbage to the skillet. Sauté the cabbage until wilted and about half the initial size, about 5-8 minutes. In a small bowl combine garlic, maple syrup, apple cider, salt, pepper, caraway and nutmeg. Pour over contents of skillet and stir to incorporate. Add cubed beets and sliced bratwurst, and stir until everything is heated through, about 10 minutes. Sprinkle browned bratwurst cubes over top and serve. It's fun to say, easy to make--and pretty tasty too! Thanks! 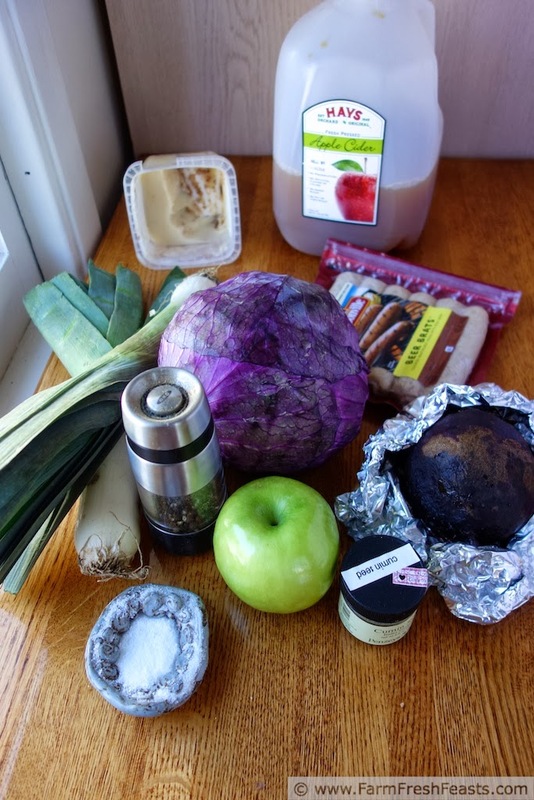 I'm trying to get more cooked cabbage into my diet these days, so this one is going on my list to try. My husband will love the maple syrup! We love sautéed cabbage around these parts (where did that phrase come from?!) so I do hope you try it and join the cabbage bandwagon. Thanks! Hot Pink Mess...I love it; it appeals to everything girlie about me. Thanks for the granola shout out my dear, although I take issue with the fact you don't think you're a young hip blogger. Say it ain't so. You're a hipster in my book. That's a good thing. If I'm old, and yet a hipster in your book . . . well I just don't know about that. But I'll take it. Thanks! I love this - I am into cabbage and sausage and this is pretty similar! Bacon, brats, sausage--it all works with cabbage. Thanks! Hot Pink Mess -- I think it might just be awesome with some venison brats that we seem to have a ha-zillion of, what happens when you take a trophy buck whose rack is coveted but whose meat is best for sausage. : - ) So did I mention I don’t want to eat those brats but at least we are one package down, thanks to Hot Pink Mess which JW was most keen on, a half-ish recipe mostly disappeared in a single sitting. I winged your recipe but followed the basic outline, adding fresh ginger and a final splash of BBQ sauce. Thanks for making dinner happen! I’d been cooking all week and frankly, didn’t want to touch the stove so this was exactly what we BOTH needed! PS What really worked, what took it from one more cabbage dish to something different was the beet, great texture and sort of a surprise since yes it’s a Hot Pink Mess. I'm so glad to know you all liked it--and ginger and BBQ sounds like excellent additions! 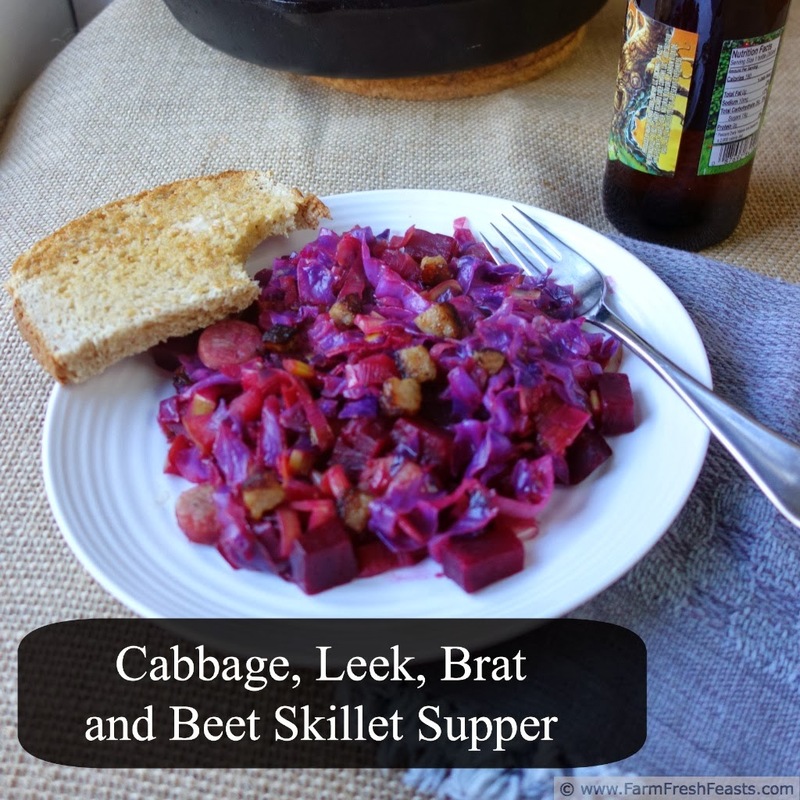 I'm always looking for a new recipe to try and your Cabbage, Brat, Leek and Beet recipe looks and sounds terrific. I can't wait to try it. It's a delicious recipe for sure--so often those Kitchen Sink ones seem to turn out so well. I'd love to hear how you like it.